Photo. 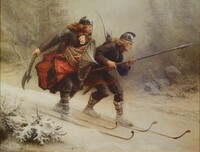 The original Birkebeiners, depicted here in Knud Bergslien’s iconic painting “Birkebeinerne” from 1869, Wikipedia Commons. Norwegian film director Nils Gaup has been re-enacting their dramatic story this winter for his new film entitled Birkebeinerne, due for release next winter. He’s been filming both in Sogndal and in the mountains above Lillehammer, where the two legendary Birkebeiner members Torstein Skevla and Skjervald Skrukka fled with the infant Håkon to Østerdalen and on to Trondheim. The drama took place during a civil war when half the kingdom wanted to kill the child. Skevla and Skrukka succeeded in their mission, though, and Håkon IV, born in 1204, was king from 1217 to 1263. This weekend’s modern Birkebeiner racers also re-enact the famous ski tour, albeit going in the opposite direction, from Østerdalen to Lillehammer. They are all required, however, to bear a backpack weighing at least 3.5 kilos, meant to signify the pack containing the royal infant as Skevla and Skrukka raced him to safety. The “Birkebeinerne” film, re-enacting the legendary skiing that changed the course of Norwegian history in 1206. Gaup’s team has also been filming at the Maihaugen outdoor museum in Lillehammer, known for its historic timber buildings that can resemble those used at the time of the original Birkebeiners. On Saturday ..March 2016, around 13,000 modern ski racers will go in the opposite direction. It will be the 77th Birkebeiner race, covering 54 kilometers from Rena to Lillehammer. Top skiers finish the course in less than three hours.